A washer-shaped fixturing device that centers the bend die on the bend head’s axis of rotation. The outside diameter of the pilot mates with the pilot counterbore of the bend die with a slip fit. 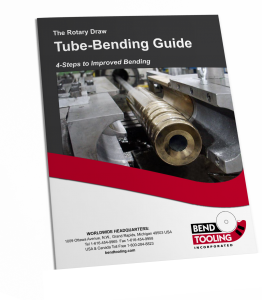 The only purpose of the pilot is to locate the bend die and is not designed bear the load of the bending process. Occasionally the pilot is an integral part of the bend die as a low-profile boss, especially in the case of platform bend dies. The disadvantage of this approach is that the pilot’s edge becomes damaged over time, and if it is integral to the bend die, it must be re-machined rather than replaced when worn out. Therefore, the integral pilot is recommended only if the cross-section of the bend die does not accommodate a pilot counterbore.